Our hives are built to last! We follow the “People’s Hive” design recommended by Abbe Emile Warré. Heavy duty construction! We build our hives with thicker lumber (1 1/2″ Doug Fir), which means the bees have an easier time of maintaining the right temperature in both summer and winter. The roof and “quilt” box combination absorbs excess moisture and allows the hive to breathe, while still insulating and maintaining the scent of the hive. 2 boxes with exterior handles for ease of lifting; additional boxes can be added below the upper boxes, as needed. 8 removable top bars on each box that have a triangular base painted with beeswax to facilitate straight comb construction. Each bar is notched on the ends to fit over nail guides in the box, which ensures even spacing of bars. 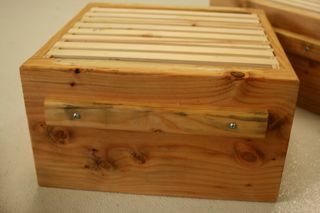 A bottom box with a removable drawer for easy cleaning and inspecting for Varroa mites or other problems. This is a slight deviation from the original Warré plans; however, the Varroa were not a problem 75 years ago! Our design minimizes air intake but allows easy accessibility for better management. Linseed oil and shellac-based finish on all exterior surfaces. 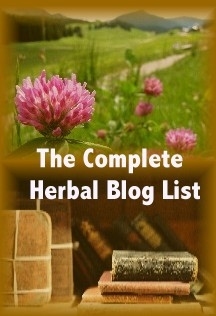 I will be adding to this page in the near future with more information on bees and hives. Thanks for your patience! In the meantime, contact us for more information. Emile Warre (1867 – 1951) experimented with over 350 types of hives to determine the most bee-friendly design that was also simple and economical for the average backyard beekeeper. An important feature (and beekeeping approach) is that the hives require minimal interference from the beekeeper. The vertical design encourages the bees’ natural instinct of building their comb downward; additional boxes are added below the ones occupied. Further, the top bars are without frames or manufactured comb; therefore, bees are allowed to build their own comb however they want, i.e., according to whatever size is best for the task at hand. Studies have shown that there are fewer issues with mites when bees build smaller, tighter cells in the comb. Overall dimensions of the Warré hive are smaller than many conventional hives; the vertical profile better simulates the natural environment of a hollow tree and is also easier to keep at the right temperature. 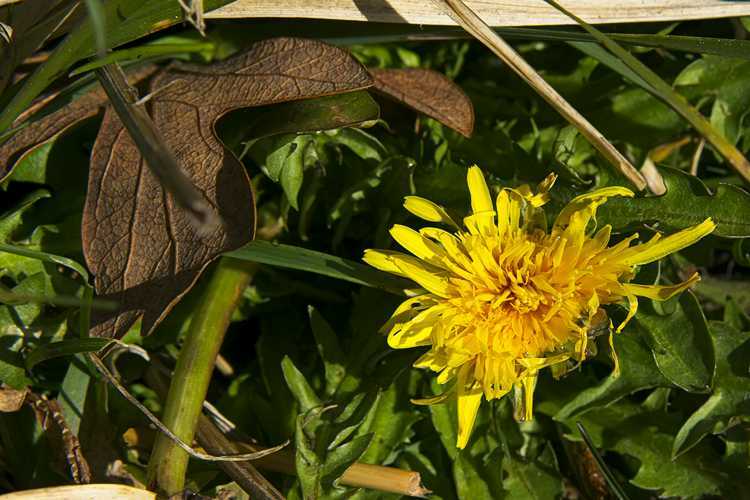 The importance of temperature control and the ability to maintain the hive scent are important to both the health of the hive and to disease and insect control. The basic box – simple, yet effective. Perfect sizing. 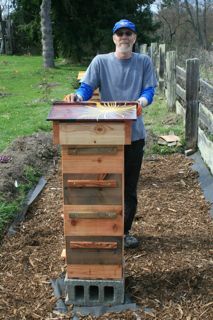 Jeff, the Master Warre Hive Builder! Dang! Nice Job! 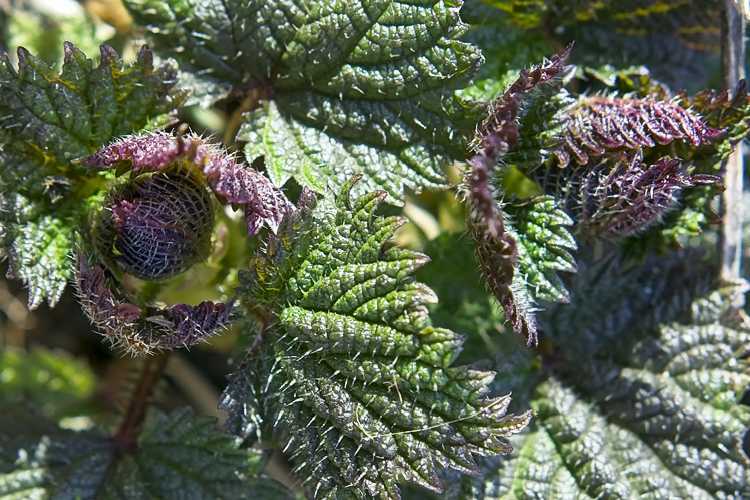 Getting ready for the bees: Bee Ready – Ain’t Mis-bee-havin’! Installing the Bees, Part I: Let ‘er Bee Free! 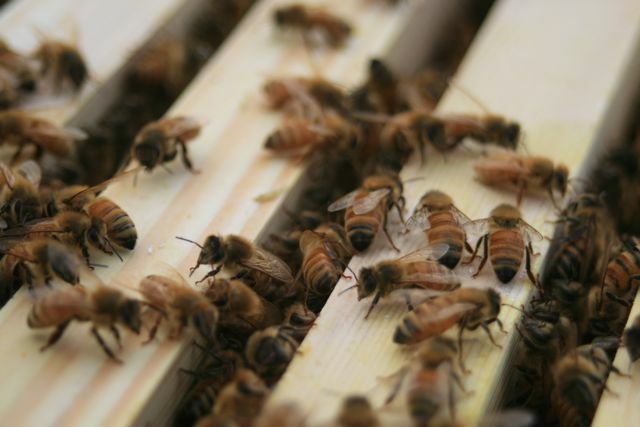 Installing the Bees, Part II: Warré Beehive Update: Save the Queen! Interested in catching a swarm?? Check out our SWARM TRAPS! They are designed to sit on top of the Warre hive boxes. They have interchangeable top bars (if the bees build comb on them in the swarm box, just pick them up and place them in the hive! ), and the removable tops and bottoms means you can stack the trap between two hive boxes and open one door or another to allow the bees to move either up or down at their own pace. Custom built if your hive is a slightly different size! Click this link for more info & photos on our swarm trap design!